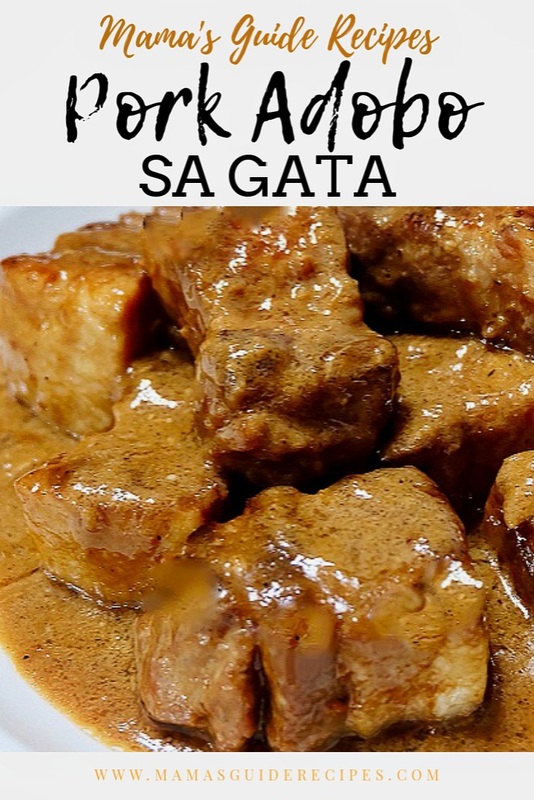 You may also cook this in ribs, liempo or chicken and pork adobo combo. For the spicy lovers, you may also add red chili peppers for some spicy kick. Happy cooking! In a pot, add the slices of pork belly and pour in the vinegar, 1 cup water, salt, pepper, minced garlic and dahon ng laurel (bay leaves). Bring it to a boil and do not stir the vinegar until it starts to boil. Just let it simmer over low heat for about 30 minutes and cover the pot. After 15 minutes, don’t forget to turn over the pork halfway through to even out the cooking of meat. After 30 minutes, remove pot cover and continue to simmer for additional 10 minutes. Remove pork, garlic and bay leaves from the pot. Discard and drain liquid. Set aside pork. In a pan, heat some little oil over medium heat and brown the pork pieces (or stir fry). Set aside. Using the same pot, add ½ cup water and ½ cup coconut milk. Let it simmer over low heat and constantly stir from time to time to avoid curdle. Add in browned pork pieces and bay leaves into the pot, season with soy sauce, salt and pepper to taste. Continue to simmer over low heat until sauce becomes thick to your desired sauce consistency. Serve hot with steamed rice and enjoy!